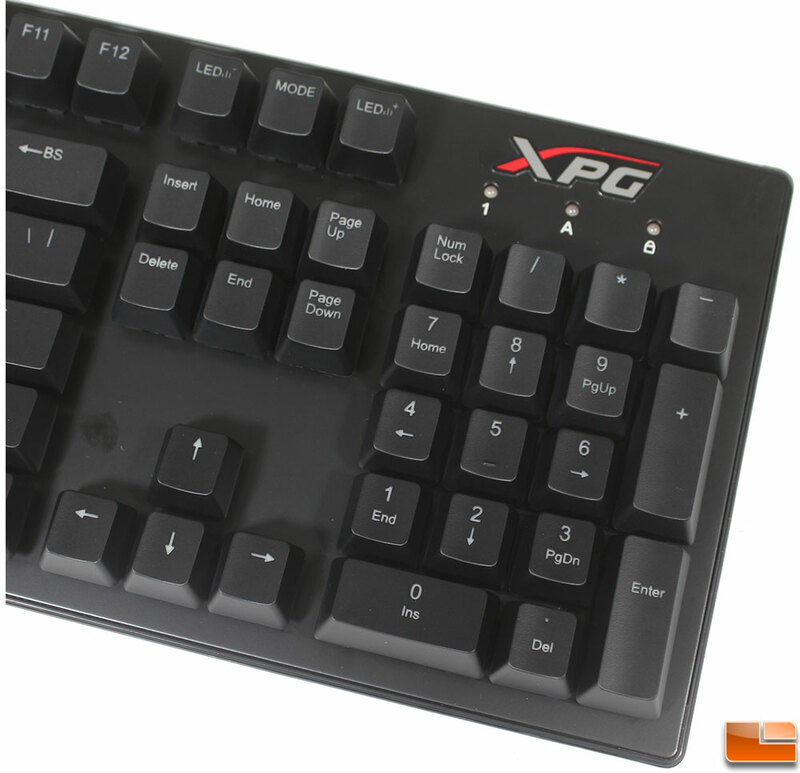 The XPG Infarex K20 is a very basic keyboard, with with the basic playback controls on the F1 through F7 keys using an additional Fn key to activate these controls. The keyboard itself doesn’t have a large frame, the entire keyboard measures 17.9 in x 5.9 in; you won’t find a much smaller keyboard with all 104 standard keys without going to a smaller key caps. 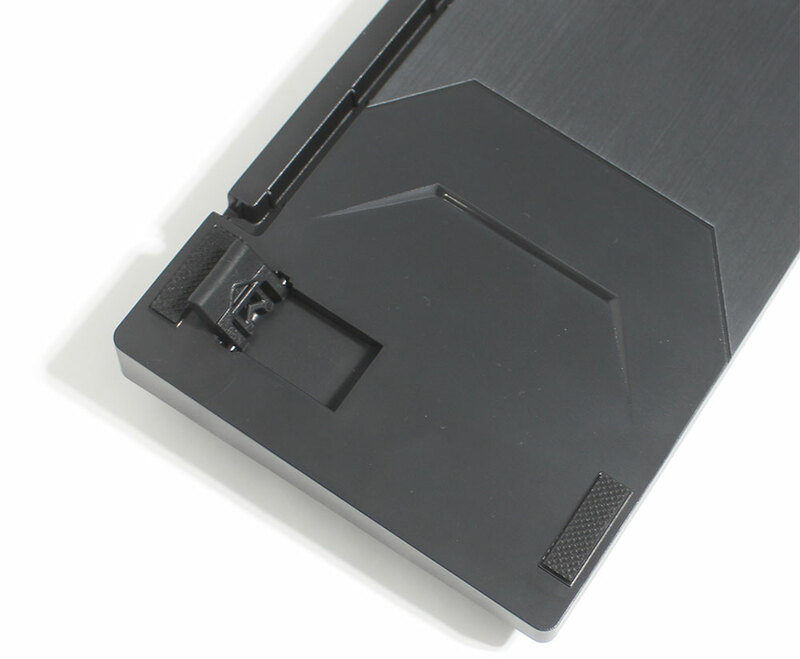 The bottom panel of the keyboard is plastic, while the top panel is a matte aluminum, which shows fingerprint smudges extremely easy. For the most part, the Infarex K20 maintains a standard keyboard layout. The main exception is the change to three keys which are usually used for “Print Screen”, “Scroll Lock” and “Pause / Break”. These three keys are now the LED controller keys, used to Lower LED Brightness or lighting model speed, Change Lighting Mode, and Increase LED Brightness and lighting mode speed (the function will depend on what mode you are using). There are eight levels of brightness, plus an Off mode. 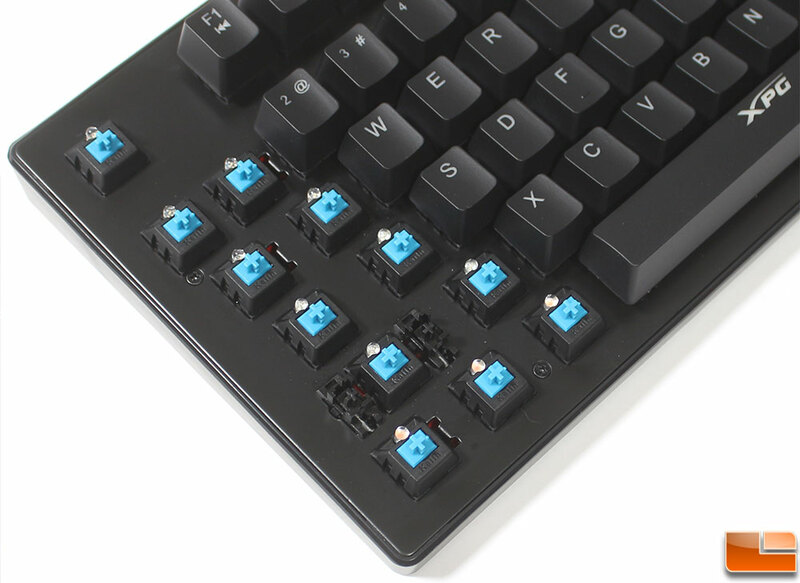 As we mentioned before, the XPG Infarex K20 uses Kailh Blue Switches, which are similar in design and feel to the popular Cherry switches, just at a lower cost to the manufacturer. The key caps can be easily removed with a key cap puller or by pulling up on the keys. With several keys removed, we find the common Cross-shaped stems, with the LED directly above the stem. As these are the same design as Cherry switches, you should be able to find replacement key caps fairly easily. A few keys from another keyboard that uses Cherry Red switches were swapped to the Infarex K20 keyboard to ensure compatibility. 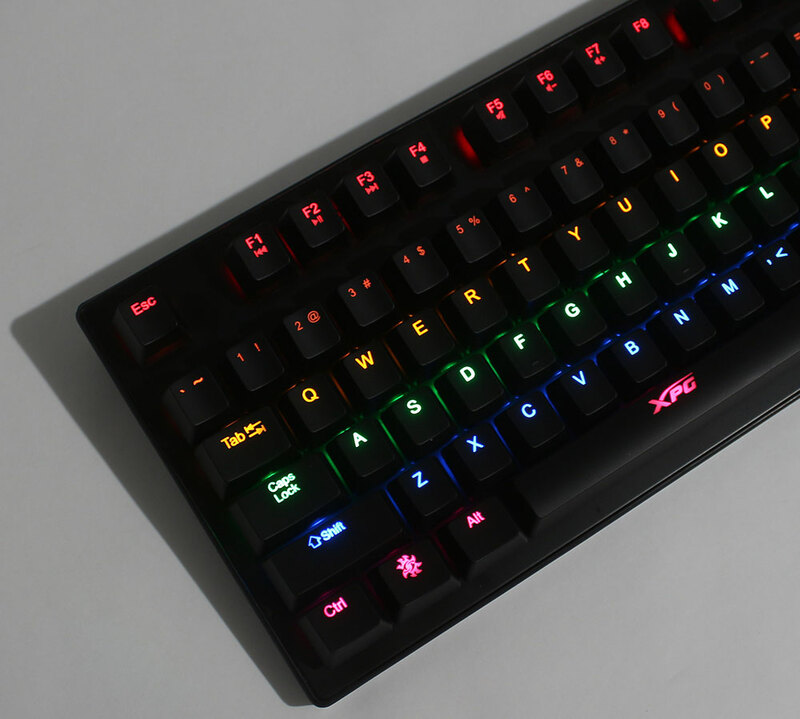 When the keyboard is connected, the initial setting is for the LEDs to be static, so from the top to bottom you have: Red, Orange, Yellow, Green, Blue, and Purple. This is the only combination that is possible, you cannot take the keyboard for the keys to be all Red for example. The keyboard cable has a nice tight braided cover on it, which allows it to bend easily, while maintaining durability. The USB-A connector is is gold plated that helps to ensure the signal maintains a solid connection. To avoid RF interference, there is a simple Ferrite core a short distance from the USB connector. Overall, the cable length is 1.8m (5Ft 10.5In), which should be long enough to reach most systems. If the cable happens to be too long, there is a velcro cable tie on the cable that can be used to bundle the cable. The bottom of the keyboard isn’t very exciting, however there are a couple of features that show the attention to detail. First, for the attached USB cable, there is a cable channel to keep the cable out of the way. Depending on your particular setup, you might want the cable to come out on a specific side, XPG has made three ways to channel the cable, left, center and right. Next, while it might be hard to tell, there are two different textures on the bottom panel. The middle is a “brushed” look, while the two sides are more of a grooved texture. On the bottom side, there are two feet that will raise the top of the keyboard about 0.5 in from the surface, each of the two feet have an anti-slip rubber coating. In addition, in each of the four corners are rubber anti-slip pads. I have been using mechanical keyboards for several years, I find them much more comfortable to type on for hours a day. When I am home gaming, I use a keyboard with Cherry Blue switches. I found that using the XPG Infarex K20 with Kailh Blue switches to have great tactile and audible feedback. When I pressed a key, I knew it was accepted by the feel and click of the switch. I didn’t have to press very hard as it has a very light 50g actuation force requirement. In addition, while I was gaming, I didn’t experience any missed keys (even when I purposely was pressing two keys at the same time thanks to the anti-ghosting function on every key. Other than my experience with the Kailh Blue switches, the rest of the keyboard checked all the necessary items. The USB cable is nicely braided to keep tangles to a minimum, and is long enough for most needs. The weight of the keyboard surprised me, however that’s because I wasn’t expecting the frame to be metal, which I actually prefer. There is no wrist rest with the keyboard, so you can use your favorite wrist rest without any issues. For those that like Cherry Blue switches, the Kailh Blue switches feel nearly identical. How closely they feel will greatly depend on the individual user. I compared the Kailh Blue switches on the XPG Infarex K20 to a Corsair Strafe with Cherry MX Blue switches. There is a slight difference in feel, which was generally the XPG Infarex K20 seemed to have a bit more of a spring back and stiffer press. Of course that could be be a perceived difference, from having used the Corsair Strafe keyboard for over two years now. When we originally read the specifications, we knew it was capable of seven colors, we were expecting that we could do those colors in any combination we wanted. However that is not the case, the Infarex K20 has each color as a separate row, and there is no way to adjust that. You are stuck with either the rainbow colors or turning them off. The built in lighting functions cover some of the most common functions, while skipping a couple such as raindrops or light up on keypress. If you are wanting a mechanical keyboard with the least amount of trim, and with blue switches, the XPG Infarex K20 would be a great choice. The XPG Infarex K20 Mechanical keyboard can be found online for as low as $44.99 plus shipping at Amazon, and includes a one year warranty. This keyboard is easily recommended at this price point for what you get. Legit Bottom Line: The XPG Infarex K20 Mechanical Gaming keyboard with Kailh Blue switches gives great tactile and audible feedback with every keypress. It is a great keyboard for gamers, the Kailh Blue switches ensure you won’t miss a keystroke when it counts. 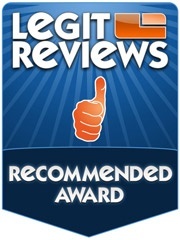 Copyright © 2002-2019 LegitReviews.com -- All Rights Reserved.